Panel integrated with quad-band GSM/GPRS industrial graded module, stable and reliable. Allow up to 120 wireless defense zones and 2 wired zones,four groups of scheduled arm/disarmed function;Each zone can be defined as one of the 8 zone types including normal,Stay home,intelligent, emergency, closed, help senior, welcome and chime. The alarm panel built-in Ni-Hi rechargeable battery that can last about 8 hours,Door/Window contacts detect any forceful break-in,Passive motion sensors detect any suspicious movement or activity,Loud, small wired siren up to 110dB alarm alerts neighbors and deters potential intruders. 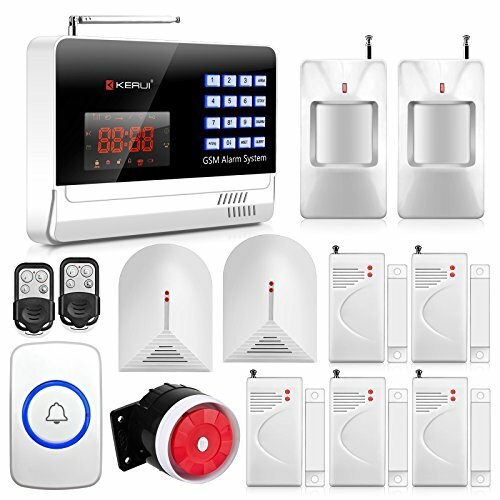 The alarm system can be used internationally,it can work under two conditions:No network,standalone on-site alarming;Put-in a GSM SIM card to call/send alert message,you can choose one of two ways or use all of them.The whole system complete with fully programmable main unit and wireless sensors .Before using,please kindly read manual and remove the insulating sheet inside sensors that come with batteries. No network,standalone on-site alarming:in this case,when there are alarming,the alarm panel and extra small wired siren up to 110db will make alert sound ,the panel with built-in siren up to 80db,no call/sms function,just somebody in home will know what's happened,you can use remote controller to arm/disarm the panel. Put-in a GSM SIM card:the alarm panel built-in GSM Module,just support GSM SIM card need 2G service,when the sensor is triggered,the alarm panel will make an call or send alert message to the alert phone number you set before.The GSM(only)frequency is 850/900/1800/1900MHZ,which can be applied in all over the world;in GSM status,6 groups calling/sms alert phone number and 3 groups help phone number you can set and control the panel via calling/sms/app/controller.